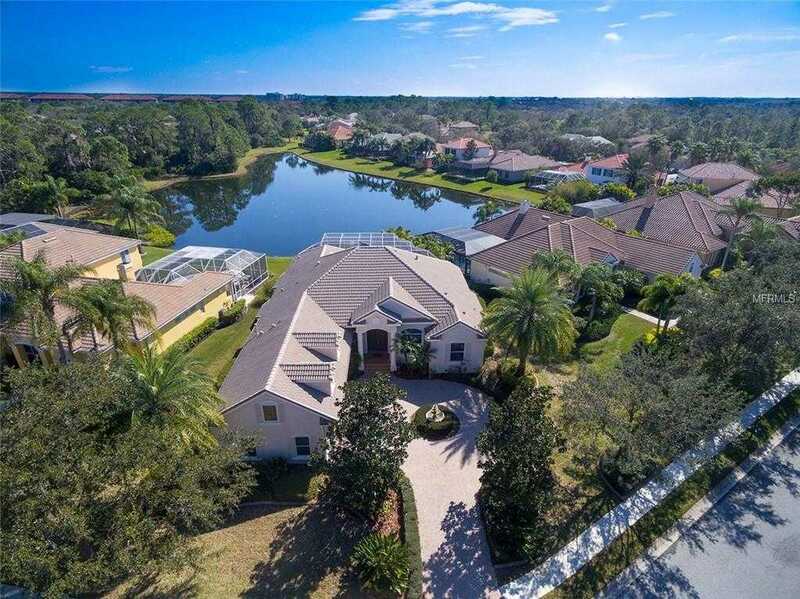 Situated in the Idyllic & Picturesque neighborhood of the Sanctuary at River Club in Lakewood Ranch, Enjoy Privacy & Peace in this Custom-Built Home by Todd Johnston. Step Through the Double Entry Doors to the Impressive Great Room Floorplan Featuring Soaring 12 8217; Ceilings, Archways, Columns, Art Niches, Hi-Hat Lighting & Invisible Sliding Glass Doors. Brilliance & Light Shine through w/Spectacular Views of the Custom Pool & Spa Area w/Extended Lanai, Alfresco Kitchen & Stamped Concrete Deck. Gorgeous Lake & Preserve Views Amid the Lush Landscaping Abounds All Around. Gourmet Kitchen Features 42 8221; Custom Cabinets, Island, Breakfast Bar, Breakfast Nook, Designer Tile Backsplash & Built-in Desk. Romantic Owner 8217;s Suite w/Capacious Oversized Walk-in Closet Offers a Sitting Area w/Wall to Wall Windows, Private Patio Door & Luxurious Bath w/Marble Dual Sink Vanities, Soaking Tub, Walk-in Shower, Designer Tiles & Bonus Storage. ADDITIONAL FIRST FLOOR MASTER SUITE w/Bath & Private Pool Entry is Perfect for In-laws or Guests. An Additional 3rd Bedroom & Bath are Situated in the Guest Wing w/Oversized Laundry Area w/Built-ins. Impressive Office/Study Features Sophisticated Custom Built-ins w/Desk. Upstairs Media/Bonus Room w/Closet & 4th Bath Could Be Used as a 4th Bedroom Suite. Multiple A/C Zones, Circular Driveway, Tiled Roof & More! Located Minutes from Shopping, Dining, Culture, A Rated Schools & Beaches. River Club has NO CDD Fees & Offers A Great 18-Hole Golf Course as its Centerpiece. Call for Showing Today! Please, send me more information on this property: MLS# A4426867 – $549,000 – 7627 Tralee Way, Bradenton, FL 34202. I would like to schedule a showing appointment for this property: MLS# A4426867 – $549,000 – 7627 Tralee Way, Bradenton, FL 34202.